Food that combines savoury and sweet flavours is usually my favourite. In desserts I often crave a hint of saltiness- it doesn’t get much better than these dark chocolate cookies with sea salt flakes. In savoury dishes, I love the combination of fresh fruit with vegetables and cheese: savoury breads, salads, pasta or pizzas- I love them all! 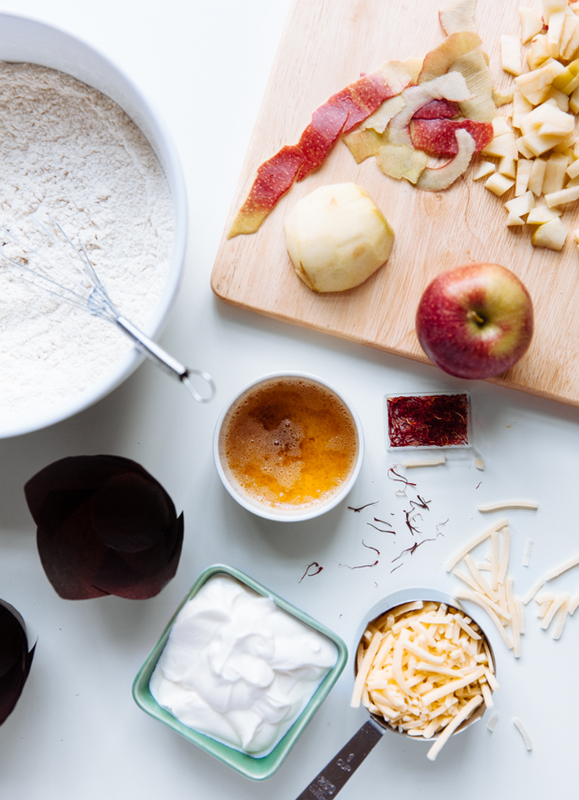 These apple and cheddar muffin are just this: a little sweet and a little salty. I used Braeburn apples- my favourite red variety, because of their gorgeous red/yellow colour and for having the right amount of sweetness and firmness. Cut in small pieces, they add softness and balance the saltiness perfectly. 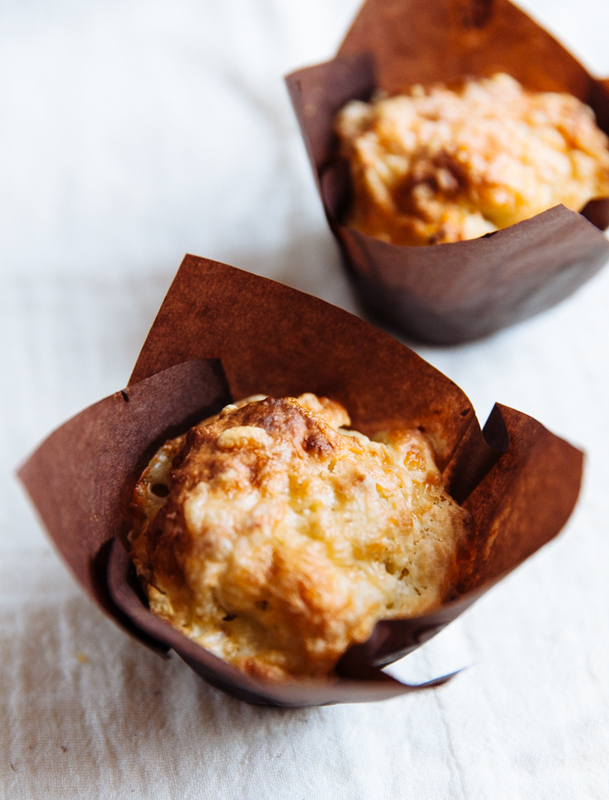 The cheddar leaves the inside soft and elastic; the extra sprinkles on top give the muffins a pizza-like crunchiness. I mean… More. Please. Preheat oven to 170C. Line 2 muffin pans with lightly buttered cases. Melt butter in a small saucepan over medium heat, until browned and fragrant (it will smell slightly nutty). Remove from the heat and set aside. In a large bowl, sift flour, baking powder and salt; add cheddar and stir to combine. In another bowl, beat the egg with the sugar until pale, add the yogurt, brown butter and saffron (if using) and mix well. 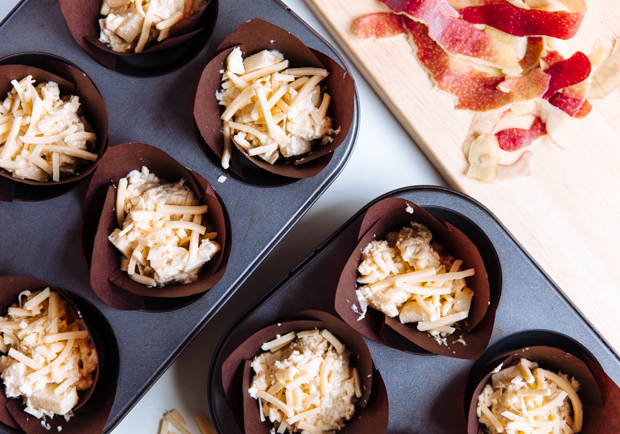 Using a large spoon, fill 2/3 of each muffin case and sprinkle with extra cheese. Bake for 25-30 minutes, or until golden brown. Take out of the oven, let cool and eat while still warm.